The same executable is used as server and viewer, it just depend on who pressed the connect button. ID: You can compare this with some kind of dynamic DNS, it give your PC a unique identifier. If someone wants to connect to you, they need to enter your identifier. Password: The password is used in combination with an exchanged key as an encryption key. You can only read data from Access code if you have the same password. 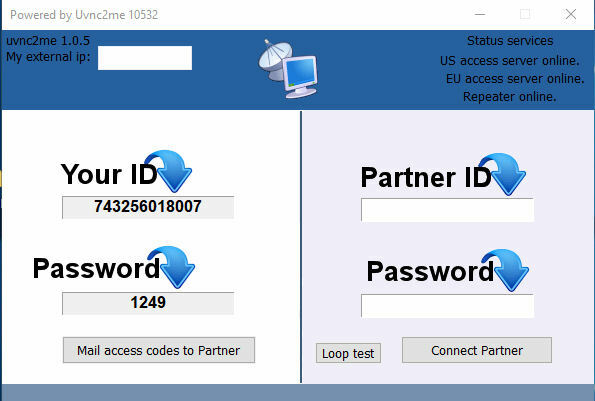 EU access server online, US access server online: We have 2 access servers online. Only one is required to make the connected. The server that answer first is the server used to initiate the connections. Repeater online: In case udp fail, we try tcp using a repeater. Loop test button: This actual just start a connection to his own, your instance of vnc2me server as viewer and server. The only usage is to test fast test the connectivity, if loopback fail, no other connection will work. You don't need to enter access code or password, this test auto use the current. After the encrypted tunnel has been setup you get the application screen. Current you can use the chat/file transfer, desktop and admin desktop function. Show Desktop: This function clone the user desktop, running as normal user. 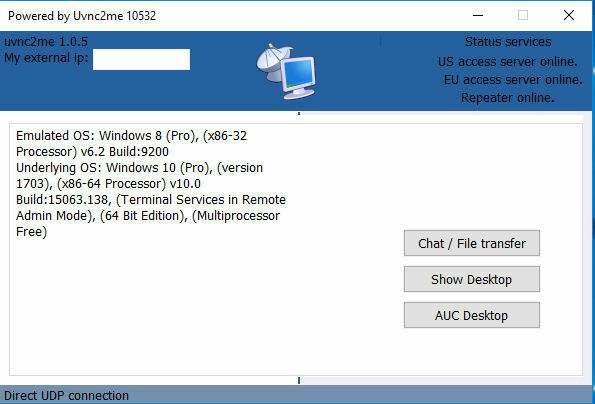 AUCDesktop: This also clone the Desktop, but the application is started as "elevated admin" so you can interact with system application that require the UAC permission. Chat / File transfer: Chat is a simple chat app, so you can talk before taking over the Desktop. Using drag and drop you can copy files via the chat function. - Dual Nat, server or viewer behind 2 Nat routers is not supported. If you’re local network is behind a Nat router and you are testing with VMware you need to use the network bridge mode. Using Nat mode you get a dual NAT. this file contain logo.bmp main.ico uvnc2me.ini. Replace the files with your own.